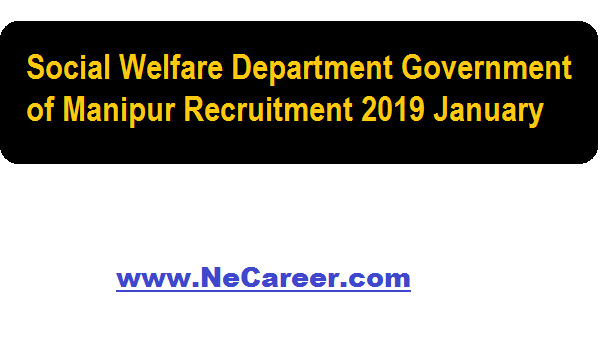 Social Welfare Department Government of Manipur Recruitment 2019 January :- Hello dear job aspirants.Welcome to North East India's No. 1 Job Portal www.NeCareer.com . We are back with a new vacancy in Manipur state. 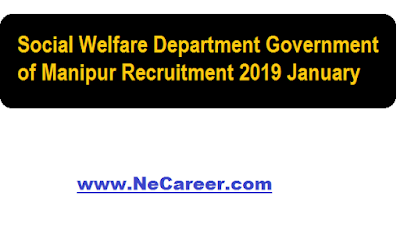 Social Welfare Department Government of Manipur has published a job notification in the month of January 2019. The department of Social Welfare , Manipur is going to engage contract employees for a period of 1 (one) for various posts under Mahila Shakti Kendra Scheme. The engagement is initially for a period of 1 year which may be further extended. The details of the vacancy is discussed below. Candidates must be 12th passed with 1-year diploma in computer application from a recognized institution. Candidate must be a Graduate from a recognized University preferably in Sociology, Social Work, Psychology, and Statistics and Economics having Computer Knowledge. Application Fee : Payment of Rs.500/- for unreserved categories and Rs. 300/- for SC/ST/OBC. Candidates mus be a Graduate from a recognized University preferably in Sociology, Social Work, Psychology, and Statistics and Economics having Computer Knowledge. Application Fee: Payment of Rs.500/- for unreserved categories and Rs. 300/- for SC/ST/OBC. Candidates mus be a Post Graduate from a recognized University preferably in Sociology, Social Work, Psychology, and Statistics and Economics having Computer Knowledge. Candidates mus be a Graduate from a recognized University preferably in Sociology, Social Work, Psychology, and Statistics and Economics having Computer Knowledge who is involved in Health, Education and welfare activities. Interested and eligible persons having the necessary qualifications may download the application forms from www.manipur.gov.in and www.socialwelfaremanipur.nic.in from 15/01/2019 to 31/01/2019. The duly filled-in application forms along with necessary documents should be submitted to the Office of the Social Welfare, Directorate Headquarter, Near 211 MR Gate, AT Lines, Imphal on or before 31/01/2019 till 05:00 pm on payment of Rs.500/- for unreserved categories and Rs. 300/- for SC/ST/OBC. 3. Domicile certificate and other supporting documents should be submitted along with the application form. Original Domicile and other certificates should be brought at the time interview. 4. The detail of the viva-voce / interview will be notified later on.